City College alumni Isis Rodriguez and several other artists were featured in a panel discussion held at the Latino Comics Expo on May 5, covering topics such as Mexico and Latin American Mythology throughout the comic world. “What Alfi Lopez and I have tried to do is create a comic book that represents authentic mexican conscience,” Rodriguez said during the panel discussion. Speaking of her collaboration project ‘Ninaji’ a comic illustrated by Rodriguez and written by Alfi Lopez. The comic is based on a Oaxacan legend about a princess who was assassinated because of a broken treaty between Mixtecs and Zapotecs tribes in the 1500’s. Workshops and lectures were held throughout the two days of the exhibit, local and bay area artists were in attendance and were able to meet and greet their fans. Kids and fans of all ages indulged in the many aspects of the comic book world and even collected the new ‘BATICALACA’ posters given out by one of the co-founders of the LCE, Javier Hernandez. A reception was held where people “ate peanuts and drank bad wine,” artist Mario Hernandez said. Mario along with his two brothers Jaime and Gilbert Hernandez created the comic series LOVE & ROCKETS. Rafael Navarro was also part of the crowd, recognized for his Sonambulo series that have won him a Xeric-Award. El Gato: Crime Mangler series creator, Michael Aushenker was also in attendance. Attendees also included Bay Area natives, creative team Mario T. Lanao & Christian Garcia known for “Reluctant Zero”, a comic revolving around an illegal immigrant from Guatemala named Guillermo “memo” Morales who dreams of supporting his family with a t-shirt company starring his sketches. 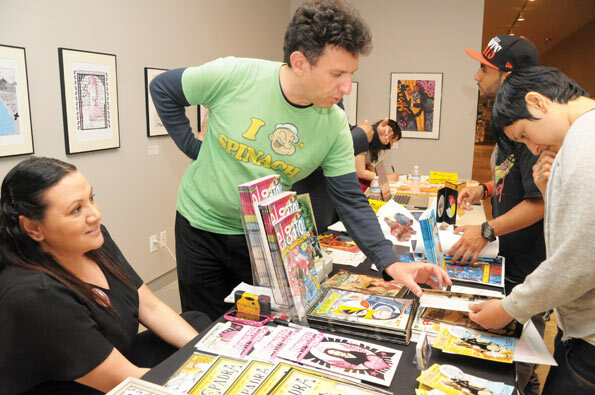 La Raza Comica: A Celebration of the Latino American Experience in the Comic Arts is currently on display at the Cartoon Art Museum in San Francisco until September 30.